LAST MEETING: Calgary fell to Buffalo 13-8 at the Key Bank Centre on January 6, 2018. 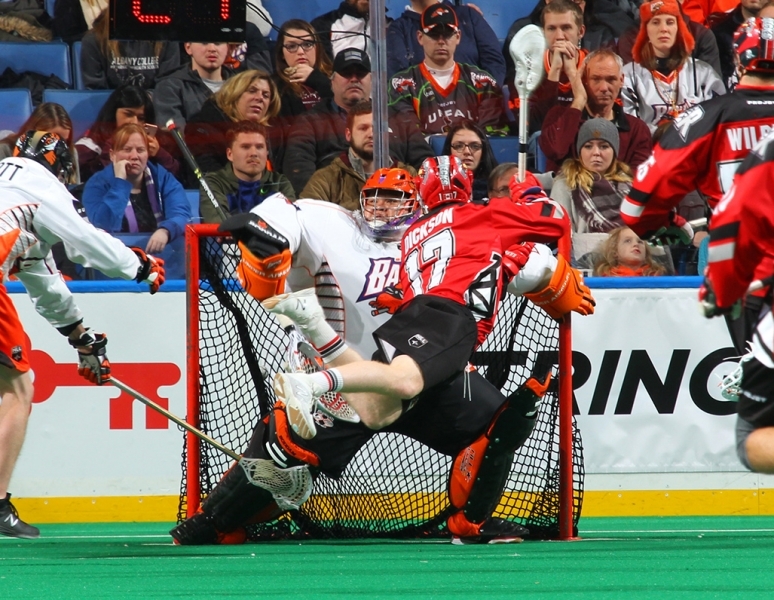 The Roughnecks host the Buffalo Bandits this Saturday in their last regular-season home game. They’ll look to get back on track after falling 13-12 in overtime to the New England Black Wolves last Sunday in Uncasville, Conn. The Bandits are hoping to solidify their position in the tight Eastern Divison standings. They’re currently tied for first with both the Georgia Swarm and Rochester Knighthawks at 8-7. The Bandits are coming off a bye-week riding a two-game win streak, most recently defeating the Black Wolves 14-11 on March 31. A lot has changed since the two teams last met. The Riggers have made improvements since their slow 1-5 start to the season, while Buffalo has overhauled its lineup. Defender Matthew Bennet was placed on injured reserve for the remainder of the season in January, replaced by Ryan Wagner. The Bandits also acquired transition player Thomas Hoggarth from the Vancouver Stealth in exchange for forward Pat Saunders in February. Shortly after, they brought in former Roughneck Shawn Evans from the Black Wolves, in exchange for Callum Crawford. The Roughnecks’ eight-goal effort last meeting was one of their lowest scoring games this season. Dickson was the only player to record more than two goals against the Bandits, accounting for half of the total tally with four. The rookie scooped five loosies, scored four goals and assisted on two in his last outing. He’s been on a roll this season notching 57 points, and leads the NLL in rookie goals with 24. The Bandits will be itching to make ground in the Eastern Division, but will face difficulty coming off a bye-week – they’ve gone 1-3 in games after byes this season. The Riggers will have to come out the gates hot to take advantage of what could be a slow start from the Bandits. Copyright © 2019 by The Calgary Flames Hockey Club. All rights reserved.